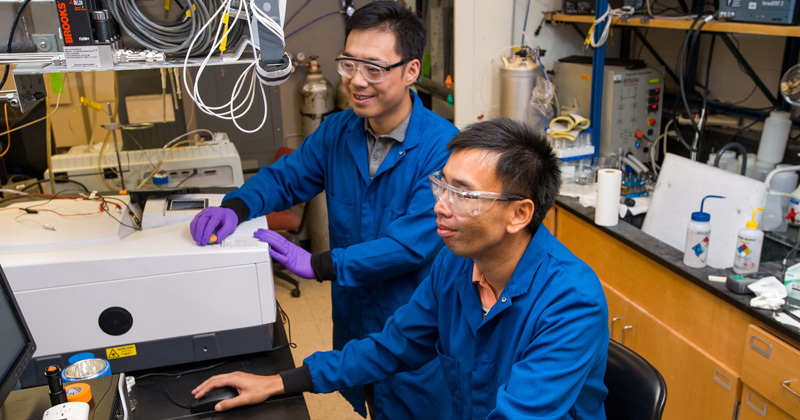 Two chemical engineers at the University of Delaware are developing new, better ways to produce fuels from sunlight. Feng Jiao, associate director of the Center for Catalytic Science and Technology, and Bingjun Xu, an assistant professor of chemical and biomolecular engineering at UD, received a $500,000 grant from the NSF for research on solar-driven carbon dioxide utilization for environmental sustainability. This research is motivated by the fact that the world’s population is expected to reach 9 billion people by 2050, and it will be increasingly critical to balance food, energy and water resources and reduce harmful carbon dioxide emissions as the population expands. Many processes involved in food and water production, from water treatment and transport, to farming, to food processing, are major contributors to carbon dioxide emissions. Then, the research team will develop a prototype reactor and perform technical and economic analysis to determine the potential to commercialize this technology. “If the result is positive, we plan to work closely with renewable energy companies and other chemical companies to scale it up,” said Jiao. If used on a large scale, this technology has the potential to reduce the environmental impact of fossil fuels and biofuel crops, which require large volumes of water and land to produce. Finally, the team will determine the environmental impacts of their device. The technology developed through this collaboration could help the solar industry and research community and could be extended to chemical processes beyond the breakdown of carbon dioxide. Preliminary research for this project was funded by a seed grant from the Delaware Energy Institute. This project brings together two experts with complementary expertise. Jiao, an expert in carbon utilization, recently shared his perspective before the U.S. Senate Committee on Environment and Public Works. In 2017, Xu received a CAREER Award from NSF for his work with the electrochemical conversion of carbon dioxide.